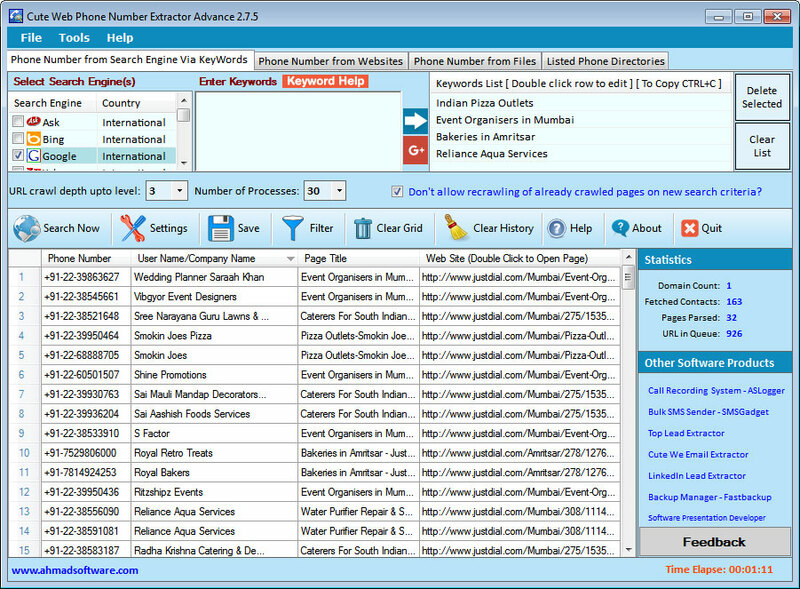 The &quot;Cute Web Phone Number Extractor&quot; is an easy-to-use, fast and result-oriented telephone number extractor software. It can extract telephone/mobile/fax number extractor along with user/company name from internet/website/local files. The phone number extractor uses search engines like Bing, Google, Yahoo, Ask, Yandex, Baidu, Mail RU, Rambler, etc to search the phone numbers. The tool allows users to find phone numbers from the inner pages of the websites on the internet. It is the rich-feature software that provides various options to search the numbers as per the requirements. To optimize search and purify results, country code, and area codes for the mobile phones operators are listed in the &quot;Cute Web Phone Number Extractor&quot; to make users easily select country code and phone operator codes. The most attractive feature of the &quot;Cute Web Phone Number Extractor&quot; are its filters once search is completed. It facilitates users getting the list of numbers which are required and relevant to the search criteria by eliminating the non-relevant phone numbers. The &quot;Cute Web Phone Number Extractor&quot; can export the extracted numbers in different file formats like Excel(.xslx), .CSV, and .TXT. Statement: First, please download the orginal installation package by clicking the download link. Of course you may also download it from the publisher's website. Using Cute Web Phone Number Extractor crack, key, patch, serial number, registration code, keygen is illegal. The download file hosted at publisher website. We do not provide any download link points to Rapidshare, Hotfile, Depositfiles, Mediafire, Filefactory, etc. or obtained from file sharing programs such as Limewire, Kazaa, Imesh, Ares, BearShare, BitTorrent, WinMX etc. Software piracy is theft. If you like Cute Web Phone Number Extractor please buy it.